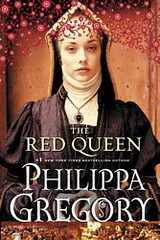 I really enjoy Philippa and like you it was The Other Boleyn Girl that made me really start to crave historical fiction. I have not read the red or the White Queen yet but I can not wait to do so! Oh, good! I’m just starting this book now and I’m happy to see that you liked it even better than The White Queen. I’m not sure why, but I’m a little nervous about this one (which makes absolutely no sense since it’s just a book – and I’ve not liked PG’s work before and survived – The Virgin’s Lover). I definitely have to agree that so far THE WHITE QUEEN is PG’s best work since TOBG (of those I’ve read, at least: all her Tudor Court books w the exception of THE QUEEN’S FOOL). I bought it at a PG author event when it first came out, but didn’t actually read it until a few weeks ago while on vacation. The reason I waited so long was because I really, really disliked THE OTHER QUEEN and so was in no rush to read her next one. THE WHITE QUEEN has restored my faith in her as an author, and THE RED QUEEN is turning out to be equally as good (I’ll have my final verdict by tomorrow). Either way, The Cousin’s War is shaping up to be a very good series. Oh I love Philippa Gregory. I read The Other Boleyn Girl while living in London and then proceeded to buy and read all of her books every last one and then visit the places she touched on with her words on my mind. For being able to do that Gregory will always be one of my favorites. I think upon it as one of the most fascinating literary experiences of my life. Being able to go while reading to the places and read the book there! White Queen and Red Queen are the only two I haven’t gotten to. I am glad you liked it, now I know I will. Sounds like an enjoyable read and I keep hearing good things about her books so one of these days I will have to give them a try. As a side comment, the cover is great. I really enjoyed this one as well. I was surprised how much I disliked Margaret, yet how much I enjoyed the book. I’m going to read the White Queen for sure now, so that I can read this one! I feel like the token historical fiction/PG idiot here. I need to just decide at some future point to spend an entire month reading the best ones. I will come to you when that day happens. I’m so glad you enjoyed this one! I am going to be reading it this week and I still hesitate before picking up a new Philippa Gregory book. Knowing that you enjoyed it makes me feel less apprehensive. I”m going to read this one soon – it seems like most people are liking it. I hated The Other Queen but rather enjoyed The White Queen, so I’m looking forward to this one. Those were my reactions too: hated The Other Queen, but quite liked The White Queen. This one is very much more like The White Queen. I’ve never read any of Gregory’s work, but a good friend of mine keeps urging me to give it a try. Sounds like I need to. I am one of those who has fallen off the PG bandwagon. I am not sure yet whether I am going to climb back on or not. I had The White Queen on my bookshelf and while I was still trying to find the time to read it, my sister decided she was going to read it. And so she took the book and I haven’t seen it since. I’m guessing that I need to get it back and read it. For as much as I like historical fiction, I’m going to pass on this one. I read The White Queen and was disappointed by it. I don’t know why but I’m not a fan of her writing. I still haven’t read The White Queen (Other Queen put me off her books for a while) but really enjoyed this one. Despite the repetitiveness, Margaret seemed like a product of her time. I loved the ending scene with Elizabeth of York, too. Wow. I used to love Gregory. I loved The Other Boleyn Girl and The Queen’s Fool. But then The Boleyn Inheritance happened. And I had the misfortunate to read Zelda’s Cut, which I found to be truly horrible. I haven’t looked back since. However, you review of this book makes me wonder if I shouldn’t give her another try. TOBG was such a favorite of mine… thanks for the review! Skip everything else she wrote on the Tudors (“The Other Queen” is truly horrible), and pick up these ‘Cousins War’ series books, they’re much more up to the standards of TOBG. I loved the Other Boleyn Girl and then was disappointed by others. I have both the White and the Red Queen to read — you’ve given me hope. I loved The White Queen and I can’t wait to read this! I’m jealous that you have it already. Like you, I loved The Other Boleyn Girl but totally went off Gregory after reading one of her subsequent books, The Queen’s Fool. I think this new Cousin’s War series is fantastic though so I’m glad I gave her another chance. I love Phillipa’s writing and the fact that its like I get transported to that time. The Other Queen was a little disappointing, but I think the trick is to read them in order. I’m reading the Red Queen at the moment. I liked all of her books on tudor history except The other Queen it was horrible. The Boelyn Inheritance and the The Vigins Lover were not the best reads but they were still good. However The White Queen was my favorite so I will def. pick up a copy of the Red Queen. My wife was pleasantly surprised and intrigued when I brought “The Red Queen” home from the book store. As someone who doesn’t typically read fiction or even historical fiction, I was thoroughly absorbed by the book. I found the view into feudal England fascinating and the narration engaging. I read it every chance I could get. I’m looking forward to picking up some of Ms. Gregory’s other books. She definitely has a new fan. I’m very surprised by the criticism. I have read every historical fiction I can find, and am always impressed with the research and flavor of Ms. Gregory’s novels. With the exception of the Wideacre novels. Then again, I am one of the few people who thought that the Twilight series was fluffy garbage. If anyone can write a novel better than Phillipa Gregory, please do so, I look forward to rating your efforts. Try Sharon Kay Penman’s books. I enjoy Gregory’s work and find it very engaging, but Penman is a true master of historical fiction. Also, you are by no means one of the few people who thought Twilight was garbage, that’s a pretty common opinion. i just finished reading “the white queen” and really enjoyed it. i have read several of gregory’s books, and loved everyone of them. they are intriguing.